Termites may have evolved sterile castes through hormone signaling changes in their cockroach ancestors. Eusocial insects, like ants, bees, and termites, have rigid caste systems: some individuals reproduce, while others are temporarily sterile workers or permanently sterile soldiers. This division of labor allows colonies to thrive, but the question remains: how did these species evolve such drastically different developmental possibilities? In a report in GENETICS, Masuoka et al. looked into the genetics underlying caste differentiation by comparing termites with their close evolutionary cousins—cockroaches. 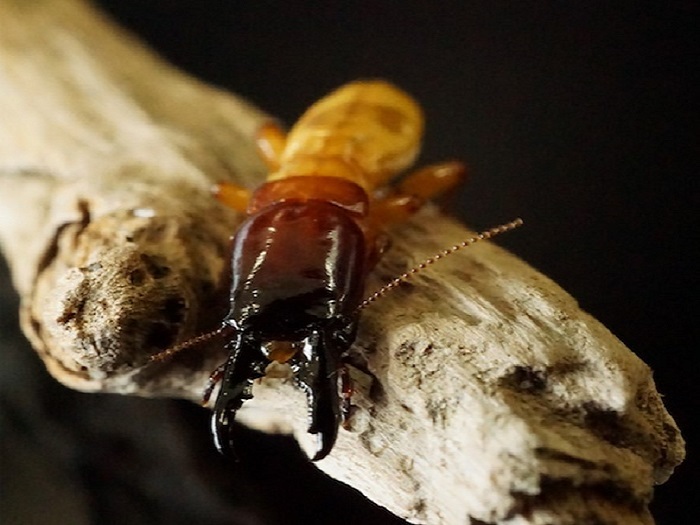 Both termites and wood-eating Cryptocercus cockroaches evolved from cockroach-like ancestors. However, while termites differentiate into castes, roaches don’t. By comparing how the two insects develop, the authors were able to glean insights into what drives specific caste differentiation in termites. They found that both the termite species Zootermopsis nevadensis and its woodroach relative Cryptocercus punctulatus are induced to molt by juvenile hormone (JH) or its analogs, suggesting that both termites and Cryptocercus share a JH-dependent molting system. In termites, JH specifically induces development toward the soldier caste, which is thought to be the earlier of the two sterile termite castes to evolve. The authors then used RNA-mediated inhibition to knock down expression of the JH receptor or genes downstream of it. Knocking down the JH receptor inhibited molting in both species, and in termites, it prevented differentiation into the soldier caste. JH receptor knockdown in both species also repressed genes involved in the synthesis and signaling of 20-hydroxyecdysone (20E), a hormone crucial for insect molting. JH knockdown affected different genes in the two species. HR39, a gene that is involved in 20E signaling, was dysregulated following JH receptor inhibition in termites but was unaffected by the same treatment in cockroaches. Knocking down HR39 in termite nymphs prevented differentiation into the soldier caste, suggesting that this gene is critical for soldier differentiation and that tweaks to 20E signaling may have been key in the evolution of complex termite societies from their cockroach forebears.